The global POP display market has witnessed impressive growth in the past decade due to changing lifestyle of consumers, across the world. This has resulted in a major shift in consumer preference, which has affected the global POP display market in a positive way. Growing budget of brand owners toward promotion and marketing of their newly launched products has paved the way for emergence of retail merchandising solution. 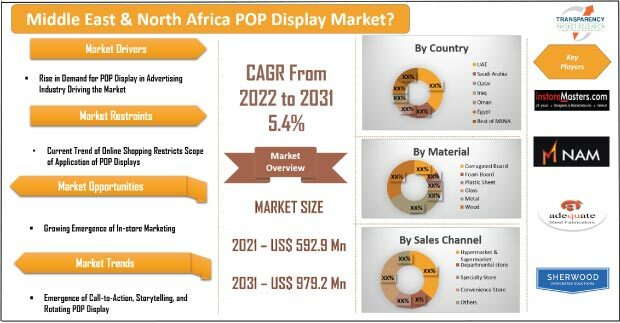 The global POP display market was valued at US$9.87 bn in 2016 and is projected to increase at a CAGR of 5.6% during forecast period 2017-2025 to reach a valuation of US$ 16 bn by 2025. Many food service brands prefer POP display for promotion as this POP displays provide high brand visibility. POP display market manufacturers are mainly emphasizing on expanding footprint through mergers and acquisitions, thereby enhancing their product portfolio. Brand owners preferences regarding POP display are also expected to be driven by the type of product to be mounted on this displays. POP displays is considered more convenient by consumers, as it draws the attention of the end users towards particular brands or special offers and advantages of the product. A number of other factors are expected to drive the POP display market. The report identifies factors such as as effective communication through POP displays, conveying precise information about the product innovations, constantly being in vision, uniqueness from the competitors, and visual merchandising as important factors responsible for market growth. Fast growth in organized retail sector, especially in emerging economies is expected to fuel the growth of the POP display market. In addition, POP display being easily recyclable and are thus more preferred by vendors than alternate other merchandising solutions. Despite the positive outlook, there are a number of other factors that might hamper the growth of the market, which includes limited reach, unclear message communication, product orientation, consumer perceptions, and shoppers discount preferences over latest innovations, etc. Globally, by material type, the corrugated board POP displays are estimated to dominate the market, in 2017, with more than 60% share of the market value, The metal POP display segment is anticipated to witness a decline in market share as they are high in weight and expensive in nature. By sales channel, the supermarkets and hypermarkets are matured markets for POP display market. The report anticipates that smaller retail shops such as convenience stores are likely to gain a high traction and are thus anticipated to dominate the global POP display market at the end of forecast period. Among the applications segment, the food and beverages segment is anticipated to dominate the market over the forecast period. Also, POP display currently finds most applications in the cosmetics and personal care segment, which is expected to gain significant share by the end of 2025. The global POP display market by product type, has been majorly segmented into counter displays, floor displays, pallet displays, sidekick displays, etc. Among these, counter and floor displays segment is anticipated to be the dominating segments over the forecast period. Regionally, the global POP display market is segmented into North America, Latin America, Europe, Asia Pacific, and the Middle East and Africa. The APAC region is projected to register the highest CAGR of 6.5%, over the forecast period. It represents the highest opportunity of US$2 bn during the forecast period of 2017 to 2025. On the other hand, North America is also anticipated to be a key regional market during the forecast period. This progress will be attributable to the high demand for processed in the U.S.
Few of the key players in the global POP display market include International Paper Company, DS Smith Plc., Smurfit Kappa Group PLC., Sonoco Products Company, Menasha Packaging Company, LLC., Georgia-Pacific LLC., WestRock Company, Pratt Industries Inc., FFR Merchandising Company, Marketing Alliance Group, Felbro, Inc., Creative Displays Now, U.S. Corrugated, Inc.
To compute the market size, in-depth secondary research is done. Data points such as regional splits and market split by product type, material type, sales channel and applications have been assimilated to arrive at the market estimates. The report comprises the forecast of the global revenue generated by sales of POP display across the retail industry. TMR triangulates the data via different analysis based on supply side, demand side, as well as dynamics of POP display market. The report begins with an overview of the global POP display market, evaluating market performance in terms of revenue, followed by TMR’s analysis of key trends, drivers and restraints witnessed in the global retail as well as POP display market. Weighted average pricing analysis of POP display based on product type is also included in the report. In order to understand and assess opportunities in this market, the report is categorically divided into five key sections on the basis of product type, material type, sales channel, applications and region. The report analyses the global POP display packaging market in terms of value (US$ Mn) and volume (Mn Units). Vital feature of this report is the analysis of the global POP display market by region, product type, material type, sales channel, and applications; and the corresponding revenue forecast in terms of absolute dollar opportunity. This is traditionally overlooked while forecasting the market. However, absolute dollar opportunity is critical in assessing the level of opportunity that a provider can look to achieve as well as to provide potential resources from sales perspective of the global POP display market. To understand key segments in terms of their growth and performance in the POP display market, Transparency Market Research has developed a market attractive index. The resulting index should help providers identify existing market opportunities in the global POP display market. This is an important section of the research report as it offers valuable insights to the readers about the areas of the market are likely to prosper and be restrained. Thorough knowledge of the drivers and restraints for the various segments is crucial to investors and businessmen. In the final section of the report, POP display market competitive landscape has been included to provide a dashboard view of companies that manufacture and provide POP display. The report contains company profiles of some of the players in the POP display market. This section of the report helps in understanding the research and development activities of the companies, their financial outlooks, and their business and marketing strategies. Furthermore, the publication also helps in understanding the threat from new comers to the existing players and the intensity of the competitive rivalry. Few of the key players in the global POP display packaging market include International Paper Company, DS Smith Plc., Smurfit Kappa Group PLC., Sonoco Products Company, Menasha Packaging Company, LLC., Georgia-Pacific LLC., WestRock Company, Pratt Industries Inc., FFR Merchandising Company, Marketing Alliance Group, Felbro, Inc., Creative Displays Now, U.S. Corrugated, Inc.